I ask people to 'put their own oxygen mask on first' by conducting this exercise in a small group of three - usually the best number. So I am asking you here now! I would ask each person to choose a Blob that feels most positive and why? We can read the Blobs because, like use, we speak volumes through our facial expression and body language - WHAT WE ARE NOT SAYING !! Touch the Blob which best describes yourself in the worst state you have been in ANY TIME in your life? AND say why - this 'why' is important because there is a story here to be told - maybe never been told! I now choose the one which is chained down by the feet. I recall a time in my life when I was locked in emotionally. I was living in fear, scared because of violent people in my life & community - working with them as a Youth Worker. I was constantly riddled with indigestion - churned up. I was surviving not living. If you have done this - if you do this ....... you have had an EXPERIENCE of sharing your own vulnerability which is a massive step. Once done means it can be done in the future with people who you trust. 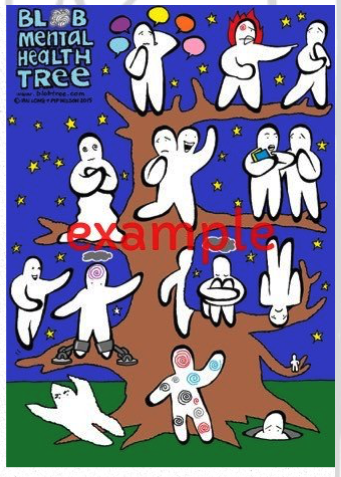 See www.BlobTree.com for a range of tools such as the BEREAVEMENT TREE which helps you to talk about a personal LOSS - good for us to do even if your loved one passed away in the distant past. There is also ones about School, Education, Feelings, Sports, Gardens, Vehicles ...... all about helping people to share themselves. Get Blobbing - experience life in all it's wholeness ....... BECOMING.